Disturb their environment by keeping your lawn mowed, watered and fertilized on a regular basis. Try to control the wildlife in your yard. Take down bird feeders and remove any standing water. Find a good organic or synthetic pest control product to keep these insects at bay. Applying sulfur to the yard is the most common all-natural method for chigger control. Sulfur is a repellant, not a killer. Because chiggers live in clusters, sulfur must be applied heavily. Powder sulfur is more effective than the granulated type but does not last as long and is a mess to apply. Powder sulfur can also be used as a chigger repellent for humans. Simply put powder sulfur in a sock and dust the sulfur everywhere you don’t want to get bit. This same method applies to the lawn. Another all-natural product for chigger control is Diatomaceous Earth. Sprinkle diatomaceous earth around the perimeter of your yard and over any areas that may offer ideal conditions for chiggers to live in. These areas include anything that may be overgrown or any area that offers a good hiding place, shade, and moisture. Focus on tall grass, weeds, and briars. There are many good choices, on the chemical side in both liquid and granulated. A good rule of thumb is to pick products with an active ingredient that ends with the suffix, “thrin”. Some of the most common are bifenthrin, cyfluthrin and permethrin. One product we suggest is Cyonara, made of lambda-cyhalothrin. One quart will cover about 8,000 square feet. Please read and follow the label directions. 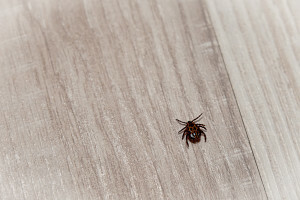 Find out more about chiggers here. Stop by Lochte Feed and General Store today to treat your yard for chiggers and keep those pests at bay this summer. We are here to help. This entry was posted on Tuesday, June 13th, 2017 at 2:25 pm	and is filed under News & Updates. You can follow any responses to this entry through the RSS 2.0 feed. Both comments and pings are currently closed.